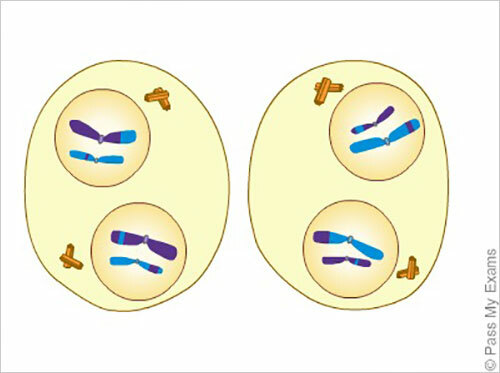 Meiosis is similar to mitosis and begins with interphase. But remember the objective of mitosis is to produce two identical cells and in meiosis the point is to make four genetically different cells. This is because the cells produced by meiosis are gametes (the cells involved in sexual reproduction i.e. sperm cells and egg cells in animals), and a key point of sexual reproduction is for genetic variation in the offspring. 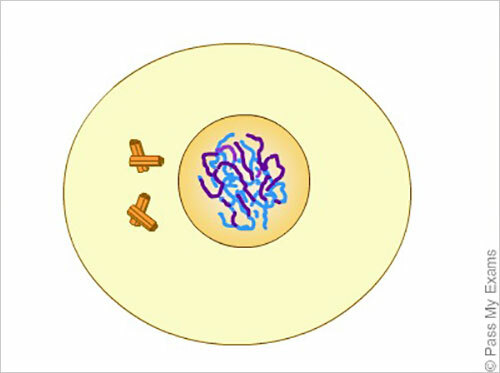 A cell in between periods of meiosis is said to be in interphase, this is a period when the cell is growing and carrying out its required functions. In humans, there are 46 chromosomes in the nucleus. 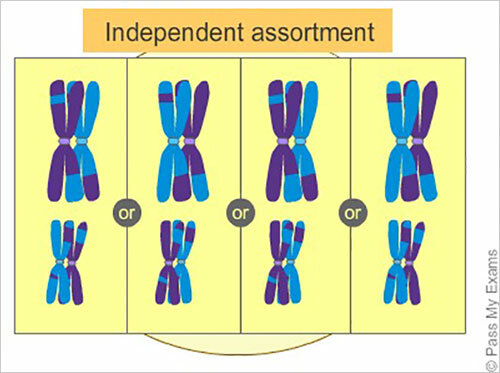 These occur in 23 pairs and are called homologous pairs. 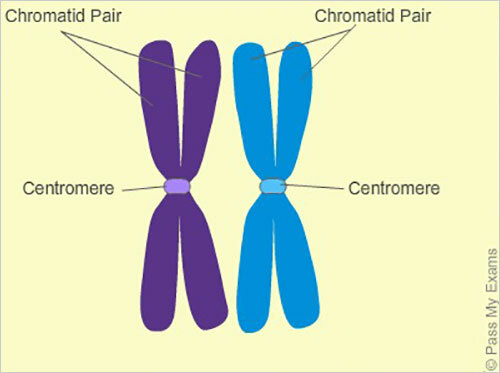 One chromosome from each homologous pair comes from the mother and is called the maternal chromosome and the other comes from the father and is called the paternal chromosome. 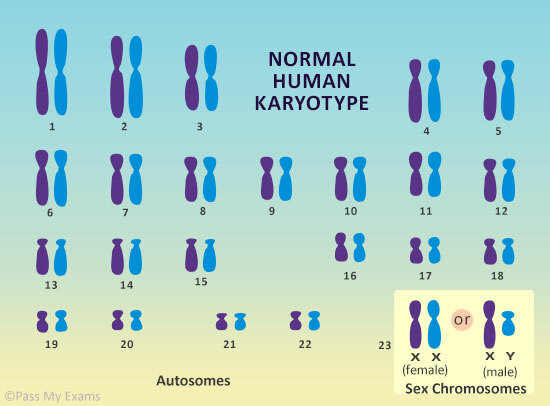 The image below shows the 23 homologous chromosome pairs in humans. 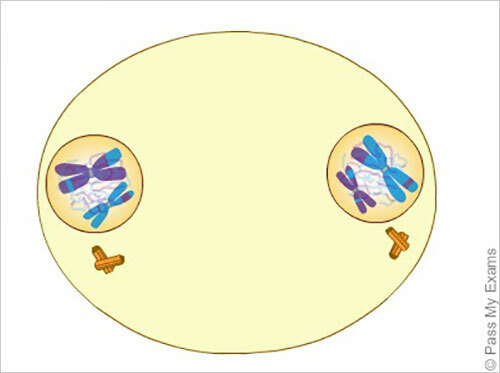 A cell in between periods of meiosis is said to be in interphase, this is a period when the cell is growing and carrying out its required functions. 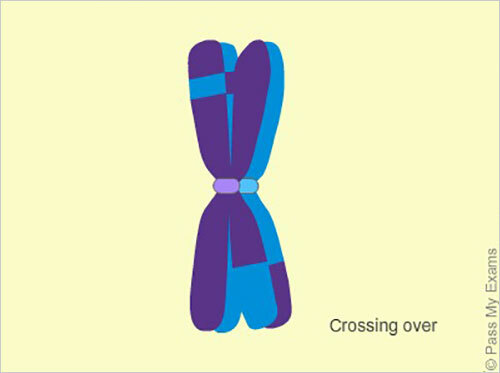 During interphase the chromosome material is in the form of loosely coiled fine threads called chromatin. These are named after the chromatin granules that contain the DNA structure situated along the length like beads on a string. Just before nuclear division, the centriole in the cell duplicates itself. The centriole is a set of protein cylinders located near the nucleus of the cell. Meiosis involves moving a lot of components in the nucleus and this is regulated by the centrosomes. Perfect replicas of each DNA molecule within each chromosome are also created. At this stage the cell has 4 copies of each DNA molecule (2 in each chromosome). When the copy is complete the cell is ready to begin meiosis. In humans we have 23 chromosome pairs in the nucleus of the cell. 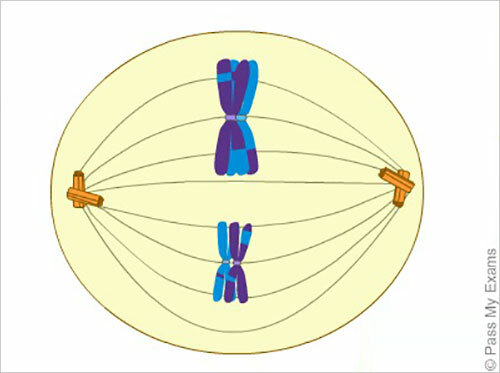 In order to show chromosome duplication, we will consider one chromosome pair. 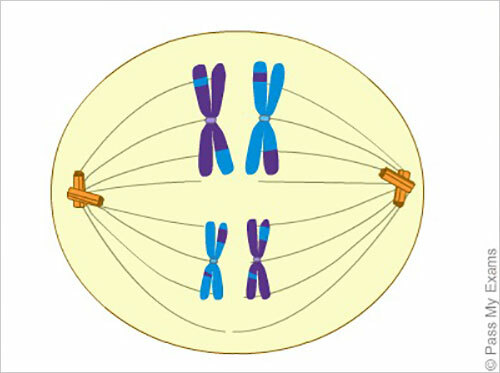 Chromosomes occur as homologous pairs, one chromosome from the father and one from the mother. During prophase a perfect replica of DNA molecule within each chromosome is created. This results in two identical chromosomes from the father and two identical chromosomes from the mother. 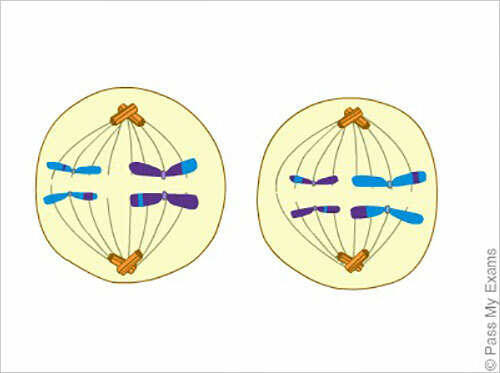 These identical chromosomes are called chromatids and are joined together by a centromere. So in the case of the 23 pairs of chromosomes in the nucleus of human cells after duplication 46 pairs are formed resulting in 92 chromosomes. The chromatid pairs become shorter and thicker by the action of coiling and tightly packing of their components. 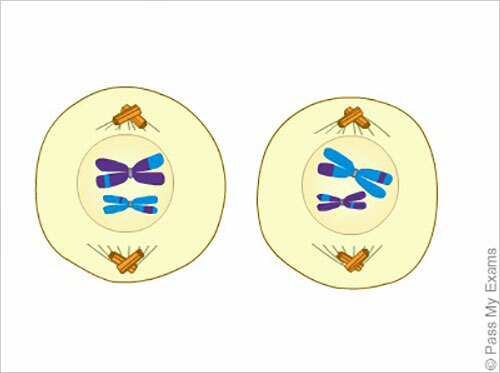 Each chromosome now exists as a pair of chromatids joined together by a centromere. Thus, the prophase nucleus contains twice as many chromosomes as usual. Homologous pairs of chromatids come together in a process called synapsis. The chromatid pair from the father comes together with the homologous chromatid pair from the mother. Two homologous chromatid pairs that come together are called a bivalent and wrap around each other. A process called crossing over now takes place. This involves a physical exchange between chromosome segments of the two chromatids increasing genetic variation. Hence segments of chromosome from the father are switching with segments of chromosomes from the mother. The nuclear envelope disintegrates and the centrioles each move to the opposite end of the cell, leaving behind a wide trail of protein spindle fibres, called microtubules, running from one centriole to the other. The bivalents line themselves up in the middle of the cell, and the centromeres of one chromatid pair is attached to one pole of the microtubule, whilst the other chromatid pair is attached to the microtubule from the opposite pole. Here due to independent assortment, the orientation of the chromatids in the bivalents takes place whilst lining up is random, and so introduces further variation in addition to crossing over in the process of meiosis. The spindle fibres pull the homologous chromosomes to the opposite poles. Halving of the chromosome number has occurred but the chromosomes are still in the form of chromatid pairs. The group of chromatids assemble at opposite ends of the cell. Due to crossing over, the chromatids are not genetically identical. The spindle fibres disintegrate and a nuclear envelope forms around the chromatid pairs at each end. A crease called a cleavage forms in the middle of the cell and the cell separates by a process called cytokinesis. 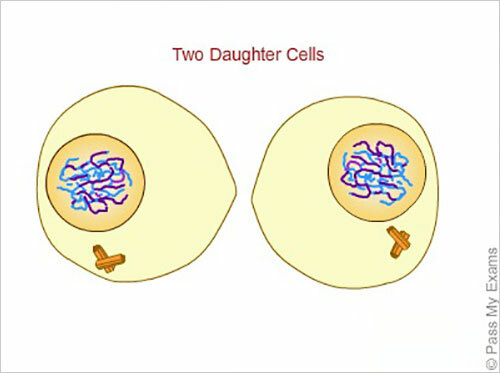 Two daughter cells are formed. The centrioles duplicate again and move to the opposite poles of the cell. The nuclear envelope disintegrates and the chromatid pairs shorten and thicken and new spindle fibres appear. The chromatid pairs line up in the centre of the cells and the spindle fibres attach to the centromeres. 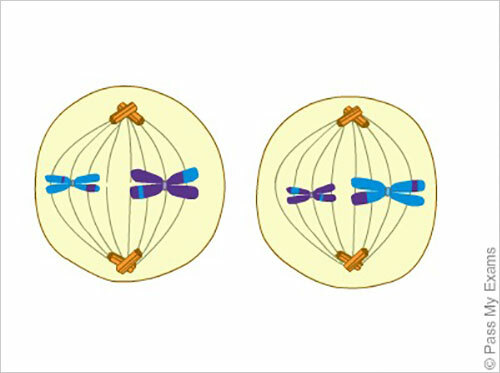 The chromatid pairs separate and the individual chromosomes are pulled to the opposite poles by the action of the spindle fibres. 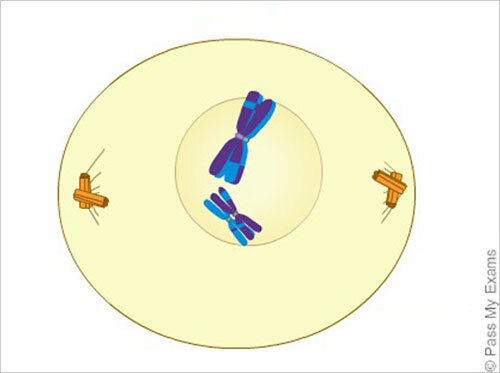 The group of individual chromosomes assemble at opposite ends of the cell. The spindle fibres disintegrate and a nuclear envelope forms around the chromosomes at each end. The chromosomes uncoil and lengthen back to chromatin. A crease called a cleavage forms in the middle of the cell and the cell separates by a process called cytokinesis. 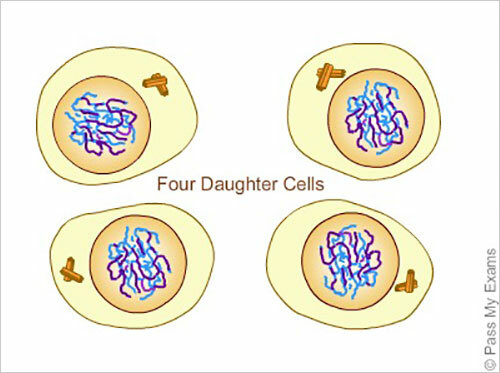 Four daughter cells have been produced from the original single parent cell with each cell now containing half the number of chromosomes (haploid) of the original parent cell. 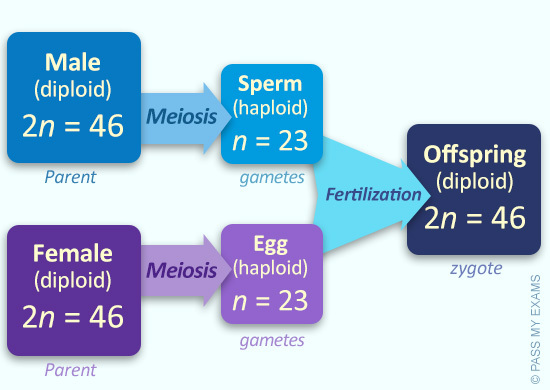 The haploid daughter cells will specialise into gametes i.e. sperm or egg cells. These fuse to form a fertilised egg (zygote) by means of sexual reproduction which will develop into a child. Therefore the child receives half its chromosomes from the mother and half from its father. Men and women produce millions of gametes (sperm and egg cells) and the process of one sperm cell finding one egg cell is random and so this along with independent orientation and crossing over contributes to genetic variation and why offspring are different to their parents and siblings.